littleBits Halloween Project Packs: Stick Figure Costume « Adafruit Industries – Makers, hackers, artists, designers and engineers! 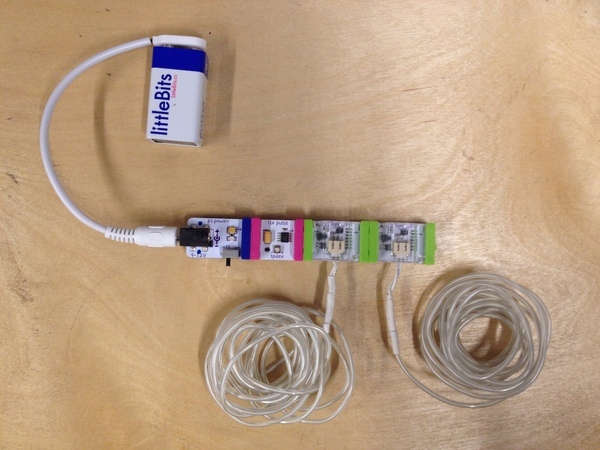 This is part of an on-going series of posts about littleBits projects. littleBits is available in the Adafruit store – Base Kit,Deluxe Kit, Synth Kit, Space Kit, Arduino Module, Arduino Starter Bundle, Sequencer Module, and Cloud Starter Bundle. With just a few snaps you can use littleBits to make instant interactive wearables: make your own light-up stick figure costume, glowing dinosaur hoodie, and more! Our new Halloween Project Pack has everything you need to trace a stick figure for a tiny human, or a hoodie version for a bigger human. Each light wire is 4 feet long and capable of being folded, bent, taped and sewn onto a variety of materials. The pulse module allows you to blink your light wires at a frequency of your choosing. The light wire has been a crowd fave for our bitizens, using it to invent customized light-up costumes for years. Now we have a super easy way for everyone to make their own costume guaranteed to light up any costume party or trick-or-treating! Share with us your Halloween hacks under the hashtag #trickswithbits on instagram and our project page for a chance every week to win one of our brand new Halloween kits to DIY-for.